Makoto Tamada is on pole of the final round of the MotoGP championship at Valencia in Spain. Tamada posted a time of 1:32.815 in the second qualifying session, below the circuit lap record held by Valentino Rossi, and also below the time of team-mate Max Biaggi, who will start from second on the grid. The newly-crowned 2004 champion, Valentino Rossi, will start from third, one place ahead of Sete Gibernau. Nicky Hayden qualified in fifth, with Troy Bayliss sixth for his final outing on the Ducati factory MotoGp bike. Jeremy McWilliams qualified in 14th place, Neil Hodgson is 18th, just behind team-mate Ruben Xaus, and James Ellison and Chris Burns are 23rd and 24th on the WCM bikes. Only Kurtis Roberts failed to qualify on the Proton KR machine. 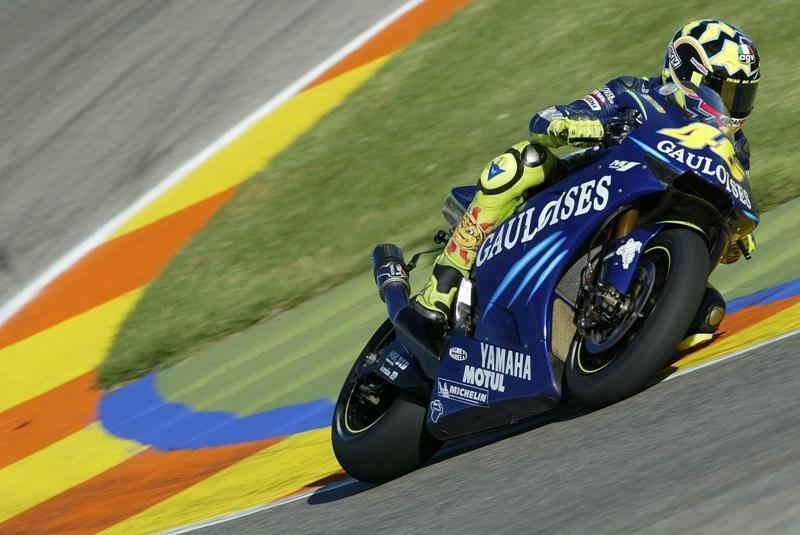 Sete Gibernau is on provisional pole for the MotoGP season finale at Valencia on Sunday. The Spaniard, riding at his home GP, posted a time of 1:33.531 to put himself at the top of the provisional grid. He leads Makoto Tamada, Valentino Rossi and Troy Bayliss. Max Biaggi improved on his first practice session to qualify fifth, while Colin Edwards moved up to seventh. Meanwhile the works Hondas of Alex Barros and Nicky Hayden dropped to 10th and 14th respectively. Jeremy McWilliams is in 16th, Neil Hodgson 20th, James Ellsion 24th and Chris Burns 25th. Valentino has taken the win at the final race of the season in Valencia, Spain, with Troy Bayliss taking his first podium of the year. Rossi qualified in third place on the grid behind the Hondas of Makoto Tamada and Max Biaggi but he started badly and entered the first corner in sixth. On lap three Sete Gibernau tried to slide past Max Biaggi in to second place and forced them both to run wide letting Rossi slip past in to second place. Without anyone in the way Rossi headed after Tamada and it didn’t take long before he out-breaked him and took first place. Tamada briefly took back the lead at the end of the straight on lap seven but by lap 15 Tamada’s tyres had started to go off and Rossi took the lead again, holding it to the line. This was Rossi’s ninth win of the year, equalling the number of wins he took last year when he won the world championship for Honda. Rossi admitted after the race that he will probably only stay in MotoGP until the end of the 2006 season before looking for a new challenge elsewhere. Nicky Hayden was having a good race and looked likely to take third place on the podium, but he breaked too late on the straight trying to get past Biaggi and ran wide dropping down to fourth. Moments later he lost the front going round the slowest corner and didn’t manage to pick it up before the engine cut out. Bayliss managed to fight his way past a struggling Gibernau to take fourth place then benefited from Hayden’s fall to move up to third and hold it to the line. Bayliss and Ducati tested new parts for the Desmosedici last week and found a new set of forks that had been around for a while unused. Bayliss used the forks and immediately felt more confident in the bike which helped him take the podium position. Ironically the late success comes too late for Bayliss who has been dropped from the Ducati team for 2005. At the final race of the season, Kenny Roberts has gone fastest in free practice, with a time over 0.5 seconds quicker than world champion Valentino Rossi, before announcing he won't take part in the weekend. Roberts posted his fastest time on the pentultimate of his 19 laps in preparation for Sunday's race at Valencia in Spain. His time of 1:33.995 will be good news for the new 2005 Suzuki team manager, Paul Denning, who is at the circuit in preparation for next year. Roberts will be replaced by the team's test rider, Greogrio Lavilla, for the remainder of the weekend. Rossi is just in front of the works Hondas of Nicky Hayden and Alex Barros, with Carlos Checa fifth so far at his home round, in what will be his final race for the Yamaha team. Jeremy McWilliams is 19th on the Aprilia, with Neil Hodgson in 20th. James Ellison is 23rd on the WCM, and his team-mate Chris Burns is 25th. In the 250cc class, Chaz Davies is currently 14th quickest.